Six Scottish Professional Football League matches have been postponed because of the cold weather. Livingston's Championship fixture at home to Morton and Falkirk v Brechin City in the same division are off. In League One, Alloa Athletic v Arbroath and Raith Rovers v Albion Rovers have also been called off because of frozen pitches. And two League Two games, Cowdenbeath v Clyde and Berwick Rangers v Peterhead, fell victims to the cold snap. But Montrose v Elgin City in the fourth tier goes ahead after a pitch inspection. Saturday's remaining SPFL games start with Aberdeen v Hibernian (12:30) in the Premiership, with four other top-flight fixtures at 15:00. Three matches each survive in the Championship and Leagues One and Two, all at 15:00. 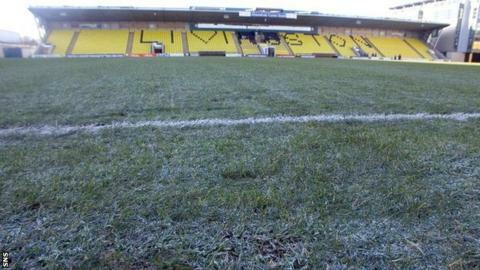 Meanwhile, Livingston's recently postponed Championship match at Dumbarton will be played on Boxing Day at 14:00 GMT.